Last Christmas, my son who's 10, got a cookbook from his Grandma. All of the recipes in this book are super simple and with a little adult assistance, he can make anything within those pages. 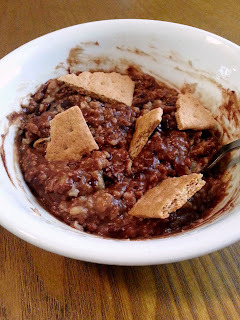 When he came across the chocolate cereal recipe he immediately wanted to give it a try but also realized we didn't have all of the ingredients. 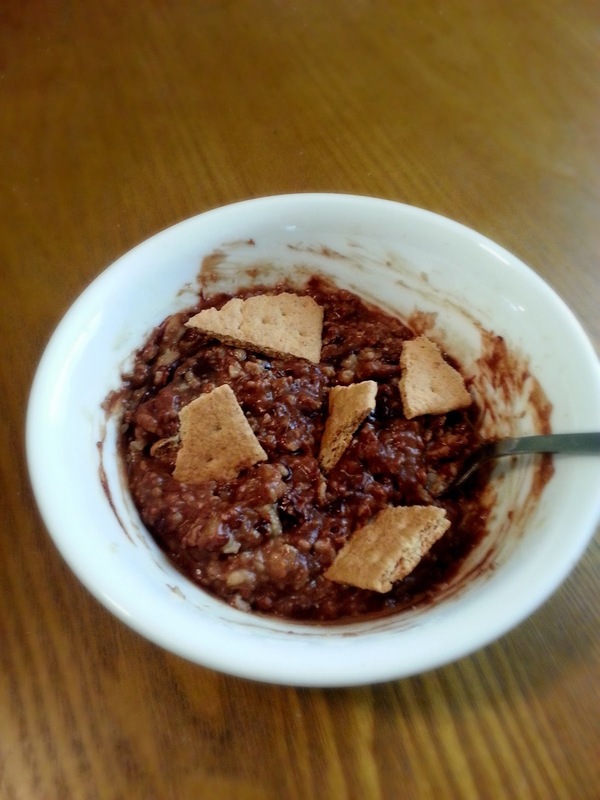 Together we went through the kitchen and came up with turning this cereal recipe into a s'mores oatmeal creation. To make this glorious chocolatey creation, you need just a few simple ingredients. Make the oatmeal according to the package directions. While it is cooking, break a graham cracker into bite-sized pieces and set aside. After the oatmeal has cooked, stir in the chocolate chips and mini marshmallows until both are melted. Sprinkle the graham cracker pieces over the top and dig in! My son can make this on his own, but having an adult nearby is a good idea. We make our instant oatmeal in the microwave and the bowl can get a little hot. We've also learned that two or three regular marshmallows can be substituted for the mini marshmallows. They just need cut into pieces. 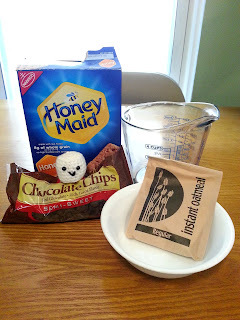 If you're a fan of super sweet things, than definitely use milk chocolate chips. That's a little too rich for my taste, so we used semi-sweet chips. Are you wondering why there's a toy marshmallow in the picture above with the ingredients? Well, that's what you use when you need a picture but your children ate all the marshmallows before you could snap said pic. 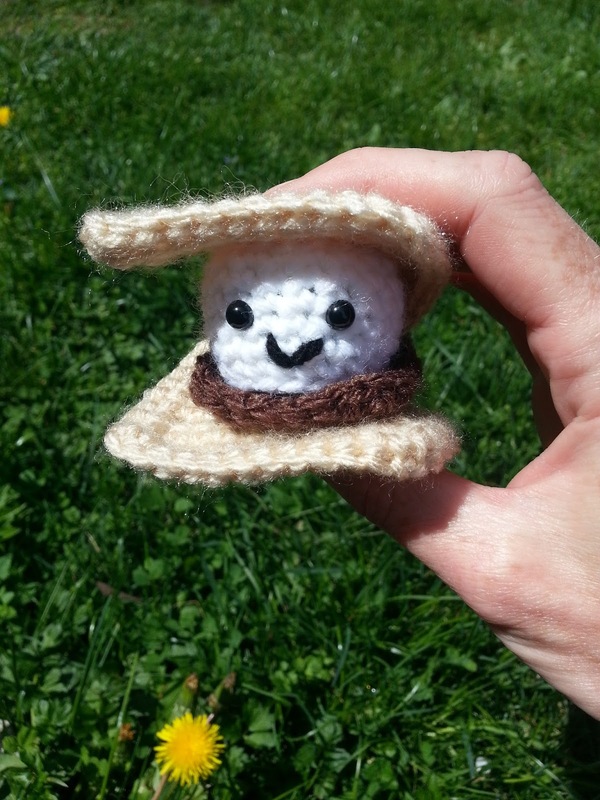 If you crochet, you can find the pattern for that happy little marshmallow over at Repeat Crafter Me. Also keep an eye out because I'm working on a post on how to turn that cutie into a crochet s'more! If you don't crochet but want your own little calorie-free s'more, head on over to my Etsy shop, Cuppa Stitches!